We also declare the private function updateScreenshotLabel() which is called whenever a new screenshot is taken or when a resize event changes the size of the screenshot preview label. Next, we create a group box that will contain all of the options' widgets. Then we create a QSpinBox and a QLabel for the Screenshot Delay option, and connect the spinbox to the updateCheckBox() slot. Finally, we create a QCheckBox for the Hide This Window option, add all the options' widgets to a QGridLayout installed on the group box. We create the applications's buttons and the group box containing the application's options, and put it all into a main layout. Finally we take the initial screenshot, and set the initial delay and the window title, before we resize the widget to a suitable size depending on the screen geometry. QFileDialog enables a user to traverse the file system in order to select one or many files or a directory. The easiest way to create a QFileDialog is to use the convenience static functions. Here, we instantiate the dialog on the stack in order to be able to set up the supported mime types of QImageWriter, allowing the user to save in a variety of formats. We define the default file format to be png, and we make the file dialog's initial path the location of pictures as obtained from QStandardPaths, defaulting to the path the application is run from. We run the dialog by invoking QDialog::exec() and return if the user canceled the dialog. If the dialog has been accepted, we obtain a file name by calling QFileDialog::selectedFiles(). The file does not have to exist. If the file name is valid, we use the QPixmap::save() function to save the screenshot's original pixmap in that file. The shootScreen() slot is called to take the screenshot. First, we find the instance of QScreen the window is located by retrieving the QWindow and its QScreen, defaulting to the primary screen. If no screen can be found, we return. Although this is unlikely to happen, applications should check for null pointers since there might be situations in which no screen is connected. If the user has chosen to delay the screenshot, we make the application beep when the screenshot is taken using the static QApplication::beep() function. 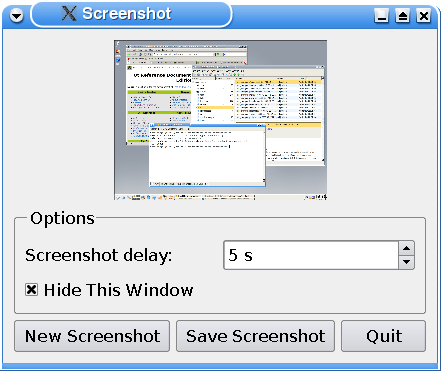 We then take the screenshot using the QScreen::grabWindow() function. The function grabs the contents of the window passed as an argument, makes a pixmap out of it and returns that pixmap. The window id can be obtained with QWidget::winId() or QWindow::winId(). Here, however, we just pass 0 as the window id, indicating that we want to grab the entire screen.